Super Hero Boy: Madeline in my living room! Madeline in my living room! Oh there are just some toys that make me wish and wish I had a little girl. Not that having a little boy isn't an absolute joy but there are just some toys that make me wish a little bit for a little girl. The Kid's Preferred Madeline 70th Anniversary talking plush available at Toys R Us is certainly one of those toys. Madeline has been a favorite children's book, of both boys and girls, for 70 years now can you believe that? Who can resist her though not to mention her dog Genevieve, I actually just shared Madeline's original book with Connor for the first time here recently and he absolutely loved it. What I really love though is this Soft Talking Madeline Plush Doll. She speaks in both English and French and is really quite generously sized at 17 inches tall. What I really love about her though is the fact that she really does look like a classic plush doll and she's very soft even which is usual for some of the other talking plush I've had in the past. She even sports classic looking yarn hair pulled back into two little pigtails. Her little yellow raincoat is pretty cute as well. What better companion for snuggling with as you read your Madeline books?! She is an exclusive doll made by Kids Preferred sold at Toys R Us stores nationwide! She is not the only Madeline doll available at Toys R Us though, you can also pick up the Madeline in Pink Pjs and both an 8 inch Madeline and 8 in Genevieve Beanie! All are available at your local Toys R Us or on the Toys R Us website! Kids Preferred is also offering a Soft Talking Madeline Plush Doll as a giveaway to one lucky reader! Leave a comment on this post. Just check out the Kids Preferred website and tell us which toy from their collection other than the Madeline dolls we mentioned here is your favorite! Nutbrown Hare Bean Bag Toy is just adorable. 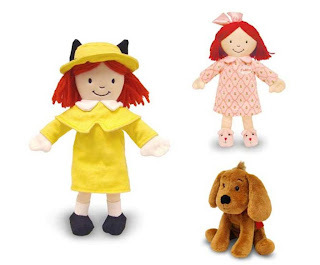 My daughter would love to win the Madeline doll! I love the Eric Carle collection! My daughters LOVE madeline. We'd love to win this. Love the entire line of Eric Carle toys! Elmer Large Plush Patchwork,how cute this is,any of my grandchildren would love him! I Like Elmer the Patchwork Elephant! So Cute! The kids would love the Smart-e-dog! I like the Smart-e-Bear. It kind of reminds me of My Pal Scout. I think the Collectible Peter Rabbit is so darling. He's my other favorite. I subscribe via email. Thank you. Good luck to all. The Mama-Baby Turtle Action Musical is so cute. I like the dog "Sizzles" from the Charlie and Lola category. The Smart-E Bear is also cool. Thanks for the chance. Liz likes the Briana Doll. I also like the Peter Rabbit beanbag toy. I like their large posable nutbrown hare. I love Emily Goes Wild for the monkey in my life. I love the giggling Charlie and Lola dolls that actually giggle those cute giggles that they do on the show! Thanks for this giveaway. I also love the Poseable Talking Charlie and Lola Set. The smart-e-bear is too cute for words. It'd be great for my nephew. Elmer the Patchwork Elephant is my favorite although the Penguin was a close second...I am a lover of stuffed animals although neither of my 2 grandchildren are. I like the My First Doll. My granddaughter would really like Elmer! The Kira doll is so cute. The smart-e-cat looks like a toy that would last a long time! thanks! My kids would also like the Smart-e-dog. I like their smart-e-dog! Thanks! I like the Giggling Charlie & Lola dolls too. I adore the Spot Large Plush. I love Elmer the Patchwork Elephant! Thank you so much for emailing me that I won. I just hit reply to your email and let you know my mailing address. This is so wonderful, I think I'm going to cry. Madeline is going to make a special little someone very happy when she comes. Thanks again, and an early Merry Christmas to all.